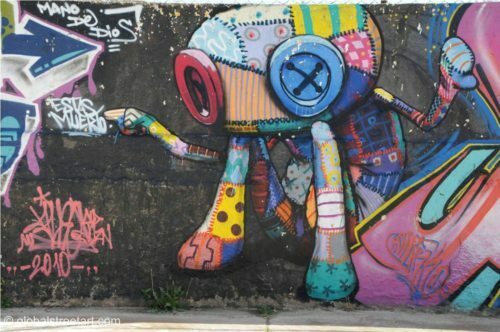 Sao Paulo’s Tinho is a friend and a true pioneer of graffiti in Brazil. 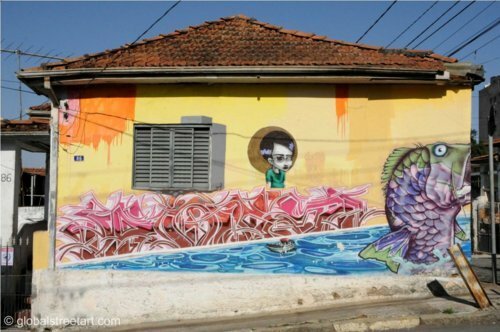 Tinho’s knowledge of his own city is encyclopedic, which is unsurprising given that he grew up with graffiti. His own work is evocative and often melancholy, commonly showing scenes with sad and suffering characters. 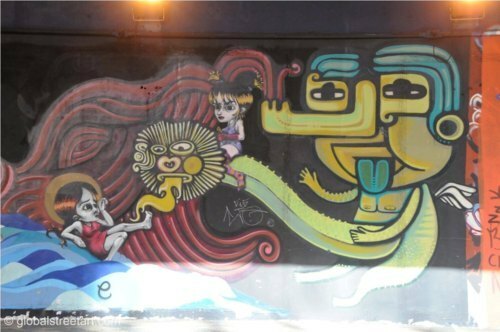 He painted his first wall aged 13 in 1986, progressed through a fine arts degree in 1994 and shows no sign of slowing down today. Skateboarding was my first influence. My father gave me my first skateboard on my 9th birthday after I saw some boys riding their boards. I took up a skateboard lifestyle and everything else was a consequence of that. 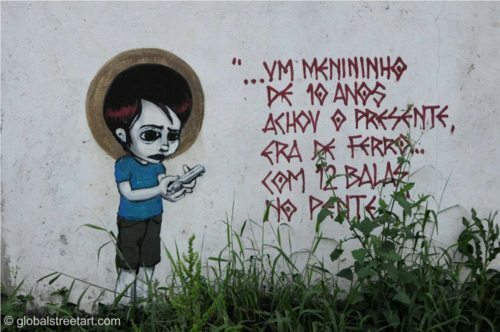 I got into the punk movement when I was 12 and, because I was very rebellious, I started doing pixacao when I was only 13 (a uniquely Brazilian form of tagging). Doing pixacao was a natural progression and graffiti naturally developed from that. I was created in the streets! 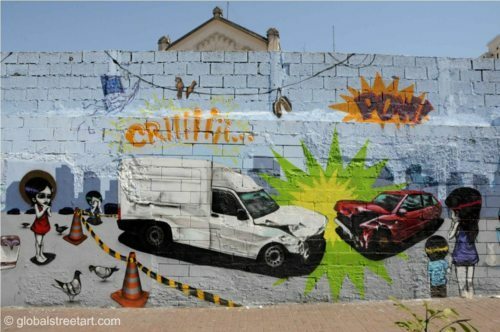 I never thought about doing something with graffiti until I started fine arts school in 1994. Before that I was looking to work in computing software! After two years of Computing Science my thinking changed: the other guys on the campus were nerds who didn’t think beyond computers and technology. I decided to change my life and I got inside the Art Universe. I do many types of characters and pieces today (and I did many others in the past too). I do something different depending on the place, the time and what I’m thinking at that moment. If I want to bomb for fun I make colourful and simple characters (the fun monsters) or throw-ups letters. 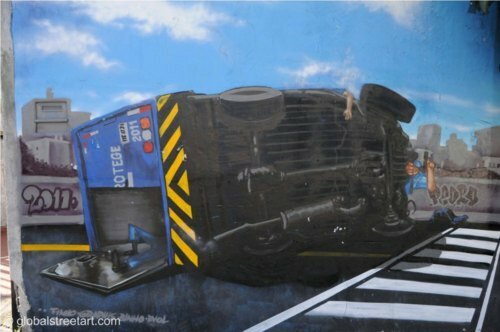 If I’m painting big avenues I like to paint car crashes. They represent unfinished trips, every project that you cannot complete. If I’m painting in abandoned houses or demolitions, I like to paint my lonely children characters with rag dolls. They refer to the loneliness of being in a big city even with millions of people around you. They’re like the souls of these abandoned and demolished houses. When I paint in the streets I’m doing graffiti, using rollers and spraycans. Anything can happen – there are streets, cars, people, police, thieves and the weather to deal with. You also have paint very quickly so you can finish the work and to not be arrested! When I paint canvases I paint alone, using oil paints and brushes. Inside my workshop: just me and the canvas in the silence. I have much more time. On the other side the people who see my work on the streets are very different from the people who see my work inside a gallery, museum or an art institution. Even the same person will have different perceptions in different places. So, I have to do different things in different ways. I like to collaborate with other guys, doing something together. It a way that styles can talk with each other. My work has to talk with the others guy’s work! In this way, my work changes a lot – it depends on who I paint with. Sao Paulo is a huge city. It’s very big, very oppressive and very competitive. I think it’s no different to any other metropolis in the world, like Paris, New York, London or Tokyo. Living in a city is very hard. Your friends are always changing, moving or dying. It’s hard to give money but it’s easy to lose. Everyone wants to be better than you and loves to put your face on the floor. If we talk about the government, politics, and system its society it is worst. You have no way out. You have to be strong to live here or you have to leave and go to small places in the rainforest or beach. In Brazil, we are used to suffering. Since the Portuguese colonization the Brazilian people have been exploited. So, to us, suffering is something that happens every day. Because of this we become unaware of the suffering and we make jokes about it. If you cannot change a situation it’s better to smile than to cry. Tinho lived in Japan from 2001 to 2004, which is where his grandparents were born. I saw my roots in Japan, which was very important to me. Everywhere I went I saw people like me. I gave me a better understanding of my my parents and my grandparents and their way to doing what they do. Tinho has also travelled to Argentina, Chile, Germany, France, Russia, the UK, Cuba and Paraguay.I asked how Brazil differed. There are many differences with these countries and Brazil. For a start – the price of paint! Spray paint is expensive in Brazil. Brazil is very big and traveling to Europe, North America, Asia, Oceania or Africa is very, very hard. It’s almost impossible to make money in Brazil. People here don’t buy art; they don’t care about art. If we managed to make money to travel to Europe or North America, we didn’t have VISAs to get to those countries so we had to fly back having not got in! Consequently, we had to create our own scene, with our rules, our thinking and with our dreams. Brazil is totally different from other countries. The education system here is very poor. We get books translated to Portuguese about 5 years after they were published in the original language (if someone decides to publish it here at all). The internet doesn’t make a huge difference because most people here don’t speak other languages.